José is just one of nearly three million corn producers in Mexico for whom the drop in prices since 1994 has had a devastating impact on their livelihoods, and that of their families. Corn also has huge symbolic significance in Mexico: the country was the birthplace of corn, and hundreds of varieties have been grown in Mexico for 10,000 years. The impoverishment of the Mexican countryside, and the corn crisis, have mobilized large elements of Mexican civil society. 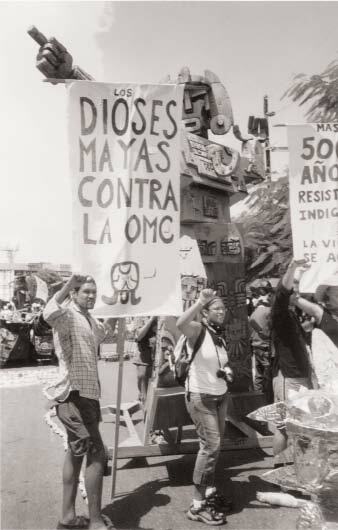 In January 2003, the protest movement “El Campo No Aguanta MÃ¡s” (“The Countryside Can’t Take It Any More”) organized a march of more than 100,000 rural workers in Mexico City. At the heart of the corn crisis is an influx of corn imports from the United States at artificially low prices. The trigger for this was the North American Free Trade Agreement (NAFTA) of 1994, which opened up Mexican markets for U.S. goods. Yet a suggestion by the Mexican government that it might re-impose tariffs on products such as corn has provoked some heavy-handed language from the United States. Various members of the U.S. Congress have warned Mexico that any attempt to renegotiate NAFTA would be unacceptable. A complaint has been brought against Mexico in the World Trade Organization for bringing anti-dumping measures in the rice and beef sectors. Such bullying makes it all the more imperative that the WTO agrees to multilateral trade rules which work for poor rural producers across the world. It should eliminate agricultural dumping and guarantee developing countries a right to protect key sectors of their economy such as agriculture. The village of Comalapas, in the southern Mexican state of Chiapas, is one of the poorest in the country. Over the last few years, travel agencies have sprung up on its main street, offering just one destination: northern states such as Tijuana, which borders the United States. Such “agencies” offer a range of services, from a bus ticket to the border to a plane ticket with a job in the United States thrown in. Comalapas exemplifies a shocking national reality: at least 300,000 Mexican workers are forced to immigrate to the United States every year. Many of them come from the rural sector, where recent trade policies have devastated rural livelihoods. One in two Mexicans in rural areas lives in extreme poverty. In the southern states—Chiapas, Oaxaca and Guerrero, where many families depend on corn—70 percent live in extreme poverty (Wodon, LÃ³pez-Acevedo, and Siaens, 2003). The falling income of Mexican corn producers in the 1990s has undermined the food security of the rural population and their access to basic social services such as health care and education. Despite the fact that most rural families eat mainly corn and black beans, the fall in prices is forcing them to sell all their corn harvest, whereas they would usually keep some back for their own consumption. Eating meat and fish is exceptional. Occasionally some families supplement their diet with chicken and vegetables that they grow themselves. The collapse in prices has affected the diet of poor communities in another way: women now have to work outside the home to top up their family’s income, which means that they cannot grind home-grown corn to make tortillas (the staple element of the local diet) in the way they used to. As a result, many families eat tortillas made from corn flour sold by large companies, which is often made from imported grain. The flour is widely available, but of poor quality. A typical complaint is that “this corn…doesn’t fill me up. Even a kilo of tortillas for lunch isn’t enough” (Alfonso, a laborer from Guadalupe Victoria (Puebla)). The crisis in the corn sector has pushed health care further out of reach for many poor families. Simply treating a child with bronchitis can cost one third of a family’s annual earnings from the sale of corn. As public health centers are scarce and badly equipped, many producers turn to private treatment, even though it is more expensive. Although education is free, most families cannot meet the cost of basic equipment such as stationery and uniforms, and children, especially girls, leave after completing primary school to work. As a result of these social pressures, many choose to leave their villages, and often their families, in search of work in other parts of Mexico, or in the United States. One of the effects in the communities they leave behind is that land is becoming increasingly concentrated in the hands of a few owners. 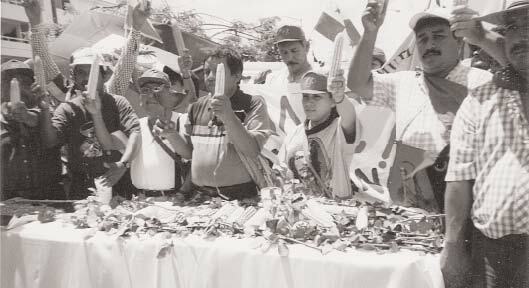 The municipality of Nueva Linda, in Chiapas, divided up its 300 hectares among its members, following land reform in 1992. Today, 90 percent of its members, many forced to immigrate, have sold their lands to the local political bosses. The pressure on producers to compete with subsidized corn imports, and the increased penetration of large companies in the Mexican corn sector, has also had serious environmental consequences. Farmers have traditionally used locally adapted strains of corn seed, or “criolla” seeds, bred over generations, to ensure that the plant is well suited to native growing conditions. However, the Mexican government has supported companies such as Monsanto to distribute “hybrid” seeds, which they claim give higher yields. The government-sponsored “kilo for kilo” program encouraged corn producers to trade in a kilo of their criolla seeds for a kilo of hybrid seeds. But the benefits are largely illusory: farmers must purchase hybrid seeds every planting season, as the seeds are much less productive after the first year, unlike criolla seeds, which can be saved and used from year to year. In addition, hybrid seeds require more fertilizers and other chemicals. In Chiapas, the intensive use of insecticides without training, instructions, or protective clothing has led to severe health problems. According to Nino, a member of the Carranza group of producers in southern Chiapas, “before, there weren’t even any pests. Now people are ill the whole time due to these liquids.” Often the seeds are provided mixed in with a powdered insecticide which it is difficult to wash off, and which then contaminates the farmer’s food. The United States is the largest exporter of corn both globally and to Mexico. For most Mexican producers, it is an uphill battle to compete with the influx of cheap corn from their powerful neighbor. Such producers are pitted against a sector, which receives huge payments from the U.S. government, and is controlled by just a handful of agribusiness companies. Corn is the United States’ leading crop, both in terms of the area that is planted and the value of production. Production has risen steadily over the past 30 years, aided by an array of factors including scientific and technological innovations. However, the sector is distinctive in that it is the largest single recipient of U.S. government payments, and is heavily dominated by a few agribusiness giants, such as Cargill and Archer Daniels Midland (ADM). While government support measures are not the only influence on corn production and prices, this issue is most pertinent in the international arena, where reductions in government payments to agriculture are up for discussion at the WTO. U.S. agricultural policy has been deliberately tailored over the last twenty years to generate a surplus for export, and to provide adequate incomes for U.S. farmers. However, the export of corn at artificially low prices is destroying the livelihoods of small farmers in developing countries. Meanwhile, the benefits of the U.S. subsidies system go disproportionately to very large farmers, while small U.S. farmers lose out. Excerpted with permission from “Dumping Without Borders: How US agricultural policies are destroying the livelihoods of Mexican corn farmers,” Oxfam International, 2003.